Description: Cartiva Nissan Honda is a business categorized under automobile dealers-new cars, which is part of the larger category motor vehicle dealers-new & used. 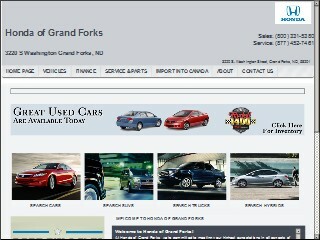 Cartiva Nissan Honda is located at the address 3220 S Washington St in Grand Forks, North Dakota 58201-7170. The Owner is Wes Rydell who can be contacted at (701)746-2020. Location & access map for "Cartiva Nissan Honda"